Hey folks we still have a couple of spots open for our annual Stillwater Outing. 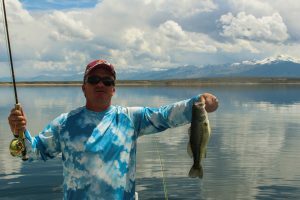 Last year we hammered Rainbows and Smallmouth Bass at Wildhorse Reservoir. The lake is once again in Great shape and should be fishing very similar to last year. We had anglers with 30-40 fish a day on this trip. This is our favorite outing of the year and 90% of our guests have done this trip multiple times with us. It is very addicting. If you want to ask questions or sign up PM me or give me a call. 775.742.1754 Information below. Eastern Nevada has some of the most prolific Stillwater Fisheries in the West. Most of them are still relatively unknown and have very little fishing pressure. Come join us this May for what we consider our best outing of the year fishing around the Ruby Mountains in North East Nevada. 5 years ago, Rob Anderson and Chris Evison were looking for a new place to host outings in the spring season. For years they have held outings at Davis Lake, 5 Dot Reservoir and Frenchman’s Reservoir. Drought in Northern California has taken its toll on these three fisheries and even though the water is back the fishing is not. 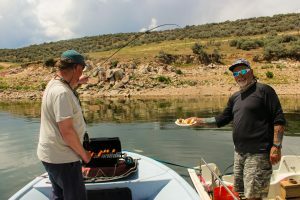 The fishing opportunities in Eastern Nevada are endless and we have picked two of the best to spend some time at with our clients and friends. Rob Anderson and Chris Evison have been fishing and teaching anglers advanced Stillwater techniques for over 15 years. Rob is a commercial fly and product designer and also managed the old Reno Fly Shop for years. One of Rob’s specialties is hosting outings and teaching large groups. Chris and Rob have worked and guided together for 17 years. Chris is well known in the area for his knowledge of Pyramid Lake, The East Walker River and numerous other fisheries in the Reno Tahoe area. The clinic will be a 2 ½ day experience covering Stillwater techniques, proper rigging, and shore line wading as well as float tube, pontoon boat and small pram techniques. There will be lots of free time to practice and catch some big Trout and Bass. Space is limited and we sell out every year. Friday afternoon – check-in and set up followed by an introduction to the weekend’s events. Saturday & Sunday – Two full days of fishing and learning new techniques on the lake. Dinner Friday and Saturday nights are included at the campground. Lunch is included on the lake Saturday and Sunday. We will be set up at one of the campgrounds at the lake. If you prefer not to camp. There are some hotel or cabin Options as well. We will have a comfortable area set up for our Friday evening event and dinner both nights. Friday afternoon – check-in and set up, dinner at the campground and intro on the weekend’s events. Saturday & Sunday – Two full days of fishing and learning new techniques on the lake with Chris and Rob including Lunch both days and Dinner Saturday night. South Fork Reservoir is probably Nevada’s #1 Public Stillwater fly fishery. The lake is Located outside Elko Nevada and 4 1/2 hours from Reno. Rainbows, Cutthroats, Largemouth Bass, Smallmouth Bass and Wipers are all catchable with a fly rod at the lake. The lake is loaded with fish and is very fertile with plenty of food. This is a fish catching trip for sure. There is great camping at the lake with three great campgrounds. The main campground has heated restrooms and showers. The sites have covered Gazebo’s, grills and campfire rings. Elko Nevada is 25 minutes away with plenty of hotel options as well. The clinic will be a 2 day fishing event and will cover advanced Stillwater techniques, proper rigging, shore line wading as well as float tube, pontoon boat and small pram techniques. There will be lots and lots of free time to practice and catch a wide variety of fish in the lake. Most of our guests on this trip are repeat clients and friends and this is a really fun weekend. We usually show up to the lake a week in advance of the outing as do most of our guests. Even though this is a scheduled 2 day outing we encourage anglers to show up a day or two early and get in some extra fishing time with us on the lake. This is our most popular outing each year and we encourage anyone interested in joining us to sign up asap. Over the last two years we have had some great fishing at the lake from pontoon boats and float tubes in October/November and again in May and early June. So this May we are going to give anglers an opportunity to learn how we fish for giant Lahontans in warmer water later in the season. We will cover a wide variety of topics including gear, safety, techniques, location and how to use the lake and the varying weather conditions to your advantage. We will have corporate room rates available starting at $39 a night October is also a great time to camp at the lake. What’s included: 2 days on the water with our veteran guides, Lunch both days, some gear and swag from our numerous sponsors, corporate room rates at local hotels and a really fun time on the water. What is not included: Tribal Fishing Permits, float tube or pontoon boat. Tips and Gratuities for the guides. Davis Lake is well known for its prolific Damsel hatch. Anglers come from all over the West to fish Davis during the Damsel hatch each year. We have also gotten to experience a great Hexagenia Mayfly hatch as well. We will be spending the weekend sharing some of our secrets on how to fish Davis Lake and also teaching angler’s techniques to use on stillwaters anywhere. We will cover everything from early morning Sight fishing the shoreline to deep water Nymphing in the middle of the day. Davis Lake is the perfect venue to sharpen your Stillwater skills and practice some of our advanced techniques. John Baiocchi and Rob Anderson have been fishing and teaching anglers advanced Stillwater techniques for over 15 years. John is well known in the Sierras for his expertise on advanced Stillwater techniques. Both Rob and John do seminars at shows and fly club meetings and Rob is a commercial fly and product designer also managed the Reno Fly Shop for years and specializes in hosting outings and teaching large groups. Rob is also a gourmet cook. The clinic will be a 2 day fishing event and will cover advanced Stillwater techniques, proper rigging, shore line wading as well as float tube, pontoon boat and small pram techniques. There will be lots and lots of free time to practice and catch some of these big beautiful Rainbows at Davis Lake. Space is limited to 12 anglers. Friday afternoon – check-in and set up, dinner at the camp and our detailed PowerPoint presentation and intro on the weekend’s events. Saturday & Sunday – Two full days of fishing and learning new techniques on the lake with John and Rob including Lunch both days and Dinner Saturday night. We will be using one of the many campgrounds around Davis Lake. Anglers are encouraged to camp with us or to use one of the local motels in the area. Call or email us for more details. Price: $325 Includes – two days guide fee, dinner Friday and Saturday night and lunch at the lake each day, free swag from our sponsors and use of demo equipment.